I am interested in software development related to MRI, specifically vessel segmentation and visualization, and sequence design related to high resolution MRA and SWI imaging. Vessel Tracking – I have been working on various vessel tracking algorithms to track bright arteries in MRA data and also segment out dark veins and hemorrhages in SWI data. I have tried simple thresholding, two dynamic thresholding methods, a gradient method and combinations of the above. Some results are shown below, the different colors correspond to different connected regions. A MIP of the same dataset is shown below under high resolution MRA. High Resolution MR Angiography – Part of my Masters Thesis is to obtain as high of resolution MRA as possible. So far we have obtained 0.25×0.25×0.5 mm, and hope to go even higher. A MIP of a dataset at this resolution is shown below. Volume Rendering with VTK – To get more sophisticated effects then shown below I decided to use the VTK library. I used VTK to implement surface rendering, 3D maximum intensity projections (MIP), and full volume rendering (with editable transfer function). 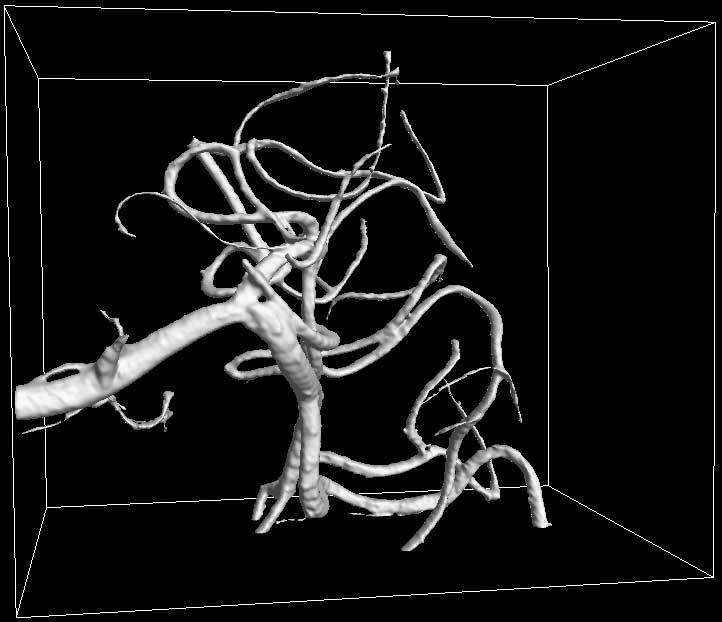 I also used VTK to visualize simple blood flow simulations, and generate animations. 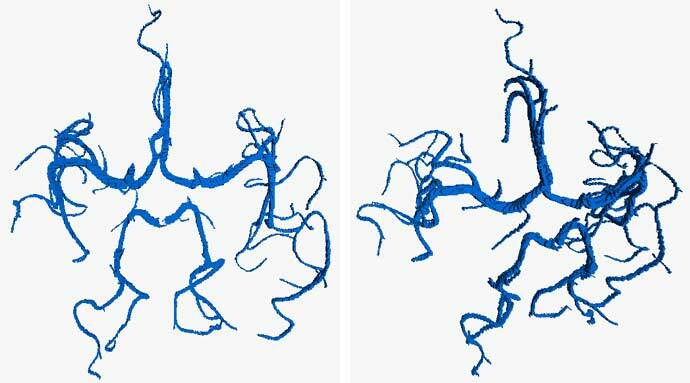 Volume Rendering with OpenGL – 3D data of blood vessel locations was made available by a vessel tracking program from MRA images. I wrote my own volume rendering program in C++ with OpenGL that would take the data, create a three dimensional object out of it and display it the the screen. The user could the interact with it, spin it around, zoom in and out, and change the display styles. Shown below a top view and then a view slightly rotated. 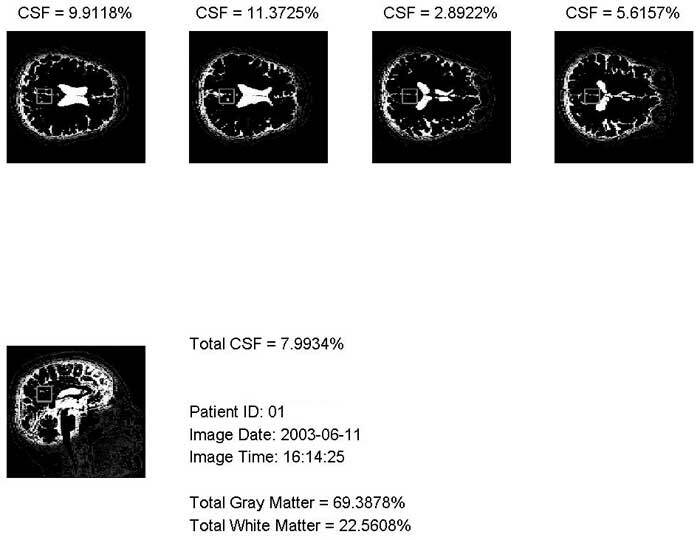 CSF Correction – Spectroscopy values were acquired for a certain region in the brain, and it was desired to know the concentration of certain metabolites that are only present in gray and white matter. The spectroscopy voxel sometimes contained CSF so to normalize the values it was necessary to know the amount of CSF in the voxel. To do this I wrote Matlab scripts that, using SPM functions, would read the spectroscopy files, to get the size and location of the region of interest, and then open, segment, and calculate the percent CSF in that region from T1 or T2 images.